Is anyone favoriting your tweets on Twitter? I don't know about you, but I love the favorites feature on Twitter. It's a handy, but frequently underutilized option. For me, I use it to keep track of complimentary tweets (recommendations, you might say). For others, they might use it to bookmark links or other tweets that interest them. However you use it, it's great to favorite tweets that you like for one reason or another. Anytime you visit someone's Twitter page, you can click on their favorites to learn more about them. But, in this age when we like to know who's saying what about us, I thought I'd share a neat website with all you Twitter fanatics. Favotter lets you see who in the Twittersphere has favorited any of your tweets! It's a bit voyeuristic, but it's pretty insightful to see who in your network liked what you said. Not too long ago, I wrote about turning your Twitter stream into a newspaper. It was a pretty popular blog post and retweeted quite a bit. When I logged on to Favotter and put in my Twitter handle, I was quite surprised and pleased to learn that several people had even favorited the link to my post (thank you all so much!). It was really nice to know that people liked my piece enough to put it in their favs folder. I wouldn't have known had it not been for Favotter! You can also use Favotter to see what tweets are popular right now, in real time, based on favoriting. Another tab lets you see the best tweets of the day and a third tab lets you search keywords that will search everyone's favorite tweets. If you're researching a product purchase or need other specific information, that option comes in handy since you're not searching everything on Twitter, but only the relevant tweets that people favorited. Try it out and let me know what you think. I thought it was pretty nifty! It wasn't my intention to write about unemployment again, but my last post on displaced workers seemed to really hit a nerve with people. Now, the Senate has decided to suspend benefits for millions of unemployed Americans. Many lost their benefits today, with no warning. Another two million will lose their unemployment compensation by July 10. I don't want to turn this into a political discussion, because it's really a humanitarian issue. How can any evolved government yank money away from its citizens with less than 24 hours notice? How can government officials that "we the people" have elected decide that they will take food from people's mouths? How can they go to bed at night knowing that millions of Americans might lose their homes because what little money they counted on will now be gone? Granted, not everyone loses their benefits today, but here in California 200,000 people did (and millions more will within the next two weeks). It's the equivalent of being fired. One minute you're hanging on, the next minute the already frayed rope is yanked away. This isn't an issue of Republican versus Democrat; it shouldn't be political at all. It's about getting America out of this recession. How can people who now have no income whatsoever stimulate the economy? They can't. How can new businesses move into vacant storefronts? They can't. How can the local department store add more positions and hire additional sales associates if people aren't coming in to buy things? They can't. It's cyclical. And, that's why the discrimination against unemployed applicants that I wrote about last week made me so mad. If someone with a job simply moves to another job, while the unemployed applicant remains unemployed, how does that help the economy? It doesn't. What's the answer? Well, I can tell you that a bunch of out-of-touch, well-to-do geezers deciding that they won't help the American people when they need it most is not the solution. It's not right for our citizens and it's not right for our economy. What can you do? Keep your ears open for your friends and former colleagues who are job hunting. Offer to introduce them to a hiring manager if it's within your ability. If you're filling a job vacancy, give that equally-qualified, unemployed applicant an interview. Today I read an article about how employers don't want to hire laid off workers. Apparently, some are even putting this is their job ads. Language such as "unemployed candidates will not be considered" or "must be currently employed" are being used in listings and the consensus seems to be that if you were laid off, you must have been let go for performance issues. I won't mix words here, this is just downright wrong and it makes me angry. As someone who has worked in internal communications for some well-known companies, I have been privy to many privileged conversations pertaining to RIFs (i.e. layoffs). I know how and why decisions are made (frankly, more than I'd like to know). Although there may be a rare instance here and there where it's an opportunity to get rid of an under-performer, the primary reason for someone being let go is financial. The person's salary is either disproportionately high by today's standards, the company is hemorrhaging money and has to start cutting people to remain solvent, management has found a cheaper way to do a job via outsourcing, the employee isn't in a revenue-generating position (e.g. sales, development, etc. ), or some wise guy on the leadership team thinks he can save money by letting go an experience professional and having a junior employee take on the duties (with no change in quality, of course). The career path I've chosen usually puts me in the last two categories and, unfortunately, I have been part of two massive layoffs in my life. Not because I was some deadbeat slacker who drooled and shopped on eBay all day, but because I cost money--money the company no longer had. And, unfortunately and erroneously, people think that anyone can write so why not lay off the gal who writes on behalf of the company? I am shocked and dismayed that while our country is in the biggest recession and financial crisis since the Great Depression, that employers would discriminate against displaced workers. As for myself, I can say that both times I was laid off, I used the time to enhance my professional skills. I attended seminars and webinars, I read countless books to learn new skills and stay current, I actively networked to grow my list of professional contacts, I maintained my writing, and I seized every opportunity to improve myself. You know, that stuff you're too busy to do when you're working 60 hours a week. And, you know what? I knew more than my happily-employed peers did and found myself frequently teaching them new things. Unemployed candidates will not be considered? That kind of thinking is misinformed, short-sighted, flawed, and downright un-American. Shame on any company that embraces this kind of unwarranted discrimination, especially in this economy. Who's with me? Let's hear it! Do you farm out your status updates? Lazy people are taking over the Earth. Too many take the path of least resistance, follow the pack, and turn off their minds. Hollywood does nothing but produce sequels to popular movie franchises and bring old TV shows to the big screen. Some days, I struggle to find people in the crowd who have an original idea or thought. It's disheartening. Now, yet further evidence of the dumbing down of America is the Status Shuffle on Facebook. I don't know if it's because I'm a writer, but this application really gets my goat (if I had a goat, that is). Basically, the Status Shuffle is for those people who are too downright lazy to tell their friends what's up. The app gives you a variety of funny lines to choose from (see the one below and try not to blow soy milk out your nose), you select the one you like, and voila your wacky, templated, status update goes up on your wall and out to your friends. Maybe the boring, the dimwitted, and the stupid need this kind of leg up to compete in the cutthroat world of status updates. I mean, how's Average Joe suppose to keep his online friends if he just tells them he had a great day golfing. Or, is Generic Jane really going to get Terrific Ted to accept her friend request if her last status update says "Took my dog to the new dog park today. Lots of nice people and doggies there!" Heck no! Jane and Joe are doomed without the canned wit of Status Shuffle, right? Alright, I can already hear you all now. "It's just for fun, Amber. Lighten up." Yeah, yeah, I get that. I guess I just don't like it. If my friend, Andy Accountant, is a bore, well, I expect that his update will be a snooze. I'm not expecting him to resort to Status Shuffle to make him the funny guy that he simply isn't. Go ahead and post a status update that says you got a new pocket protector today, Andy. That's the real you! Using the Status Shuffle update of "I hate mosquitoes!!! I mean, I know I'm delicious but damn..." is ridiculous. I guess it boils down to being genuine. Yeah, it's just a fun app. Woo hoo! But, if you're in my online network, it's because I like you. You, just the way you are. Today is National Donut Day. I'd rather be writing about fried dough and sugary icing, but I'm ticked. Why? This week, illiteracy in America took a huge leap forward. As a writer and communicator, I love words. The dictionary and thesaurus are two of my favorite books. I imagine many of you are fans of the written word, too. 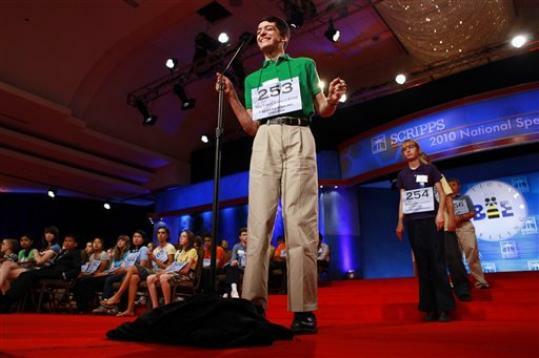 Well, some lunatics are actually protesting this year's Scripps National Spelling Bee. Apparently, they think we should all spell like simpletons (e.g. froot instead of fruit, hefer instead of heifer, slo instead of slow). They call it simplifying; I call it stupidity. The nearly 300 children who made it to Washington D.C. this week to stand on stage at the National Spelling Bee are amazing. They have studied, learned the history behind all the root words, and taught themselves the complexities surrounding language. Instead of honoring these kids with signs of support, these idiot protesters are passing out buttons that say, "Enuf is enuf. Enough is too much." Is it really so hard to learn how to spell a word properly? Get a word a day calendar, pick up a dictionary, read, educate yourself. In an era of texting, people are becoming even lazier spellers, too. To me, a misspelled word in a professional context (not a typo, but an obviously misspelled word) is an immediate red flag. Heck, if the love of my life were to write me the most amazing love letter, but it was full of spelling errors, I'm afraid I'd have to kick him to the curb. So, wise up, America! Love the English language, learn to use it, and teach yourself to spell properly. You don't have to be a spelling bee champ to know the difference between to, too, and two. When you're a student in college, adding that first company to the ole' resume can be humbling. Will it be a job at Barney's Burger Hut? Or your dad's business, Joe's Gardening? Well, a few hundred kids in Pennsylvania will get to add the Pittsburgh Penguins as their first employer! Now, the catch. The job with this National Hockey League (NHL) team isn't glamorous, but if you sell it right, it could be a great conversation starter in these students' future interviews. The job? Flushing a toilet. Yep, you read right. The Penguins new arena is almost ready to open, but the construction team needs to test the plumbing. Apparently, this can only be done properly if all the stadium's toilets are flushed at exactly the same time. That requires 400 flushers to man the potties and urinals, simultaneously. Well, the toilet jockeys have now been selected and the "Student Flush" goes live on June 10. Two-hundred and fifty students (all of which must be at least 18 years old, since this is obviously no job for a kid!) will participate in the momentous occasion; the other 150 flushers will be highly-paid, professional, construction workers. What was your first job in college? Does it beat being a part of the great flushapalooza?